Finally! our first beautiful day in the Bay Area in over a week. The temps are still below normal for this time of year hovering around 70 degrees, but at least the skies were sunny and blue. A perfect day for a hike...so my husband and I decided to go to Rancho San Antonio Open Space Preserve in Los Altos Hills. What a beautiful place by the way, clearly marked trails, beautiful scenery with mountain vistas and lots of wild life...even saw a rattlesnake! Anyway, I knew that I would not want to make dinner after returning from a three hour hike and so before we left I prepped this dish in 15 minutes. And when we got home it was ready and waiting. Just a perfect day! In a large bowl mix all ingredients together and set aside. Cover soy curls with boiling water and rehydrate for 15 minutes, drain really well on paper towels or a dish towel to remove excess moisture. Chop into 1" pieces and place in a large bowl. While soy curls are soaking, prep other ingredients. Combine all ingredients together and check for seasonings. Let mixture chill for at least an hour for flavors to develop. 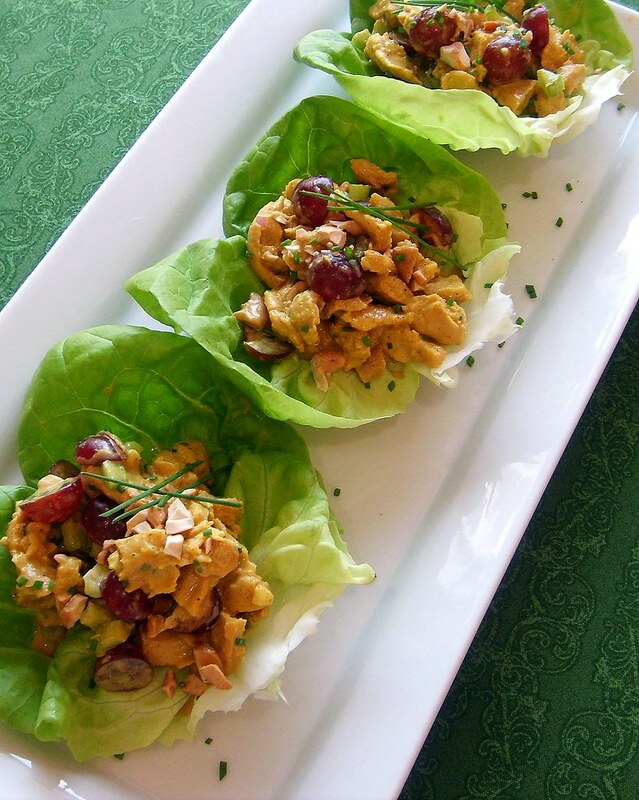 Place about 2 tbsp of mixture in the center of each lettuce leaf and garnish with additional chopped cashews and chives. Since it's Memorial Day weekend, my husband asked if we could have hot dogs for dinner. I'm not certain if you've ever had a Chicago style hot dog, but the toppings really make it unique. 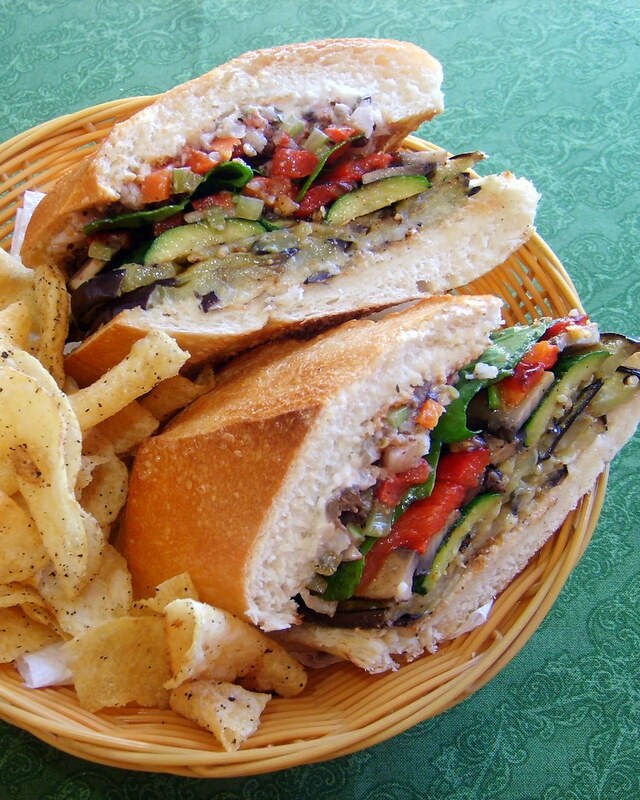 It's crunchy, spicy, sour and gooey because it's garnished with cucumbers, tomatoes, jalapeno peppers, pickles and cheese. 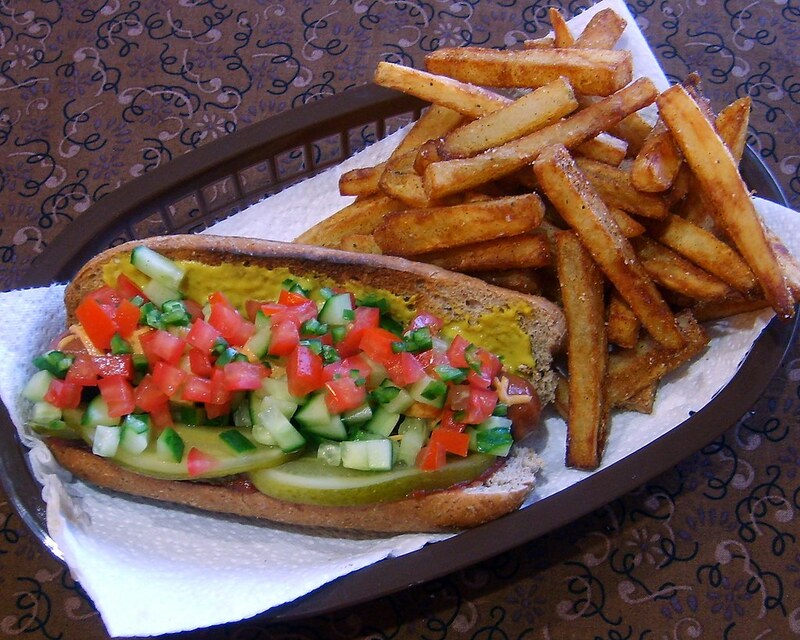 I've always loved the toppings and this meatless dog is really delicious! To accompany the dogs, I made Ocean City Boardwalk Fries with Old Bay seasoning and apple cider vinegar. I grew up in Maryland eating these fries and it brings back so many wonderful memories of hanging out on the boardwalk on a warm summer night with a big cone of spicy fries. Dice all vegetables and set aside. Heat a frying pan on medium heat, add canola oil and jumbo dogs. Cook for about 4 minutes, turning so that every side is lightly charred. Remove from heat and sprinkle with Daiya Cheese and cover with a lid for about two minutes for cheese to melt. Toast buns and pile on all the ingredients of choice. Peel and slice potatoes into 1/4" slices and place in a large bowl and cover with cool water and let sit for 30 minutes. Drain potatoes and dry really well with paper towels or a dish towel. 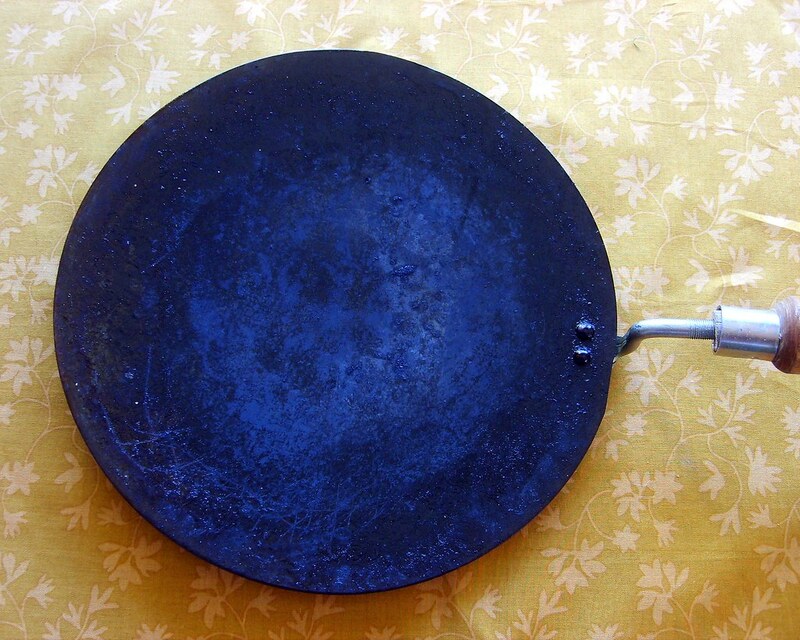 In a deep dutch oven or stock pot, using a deep frying thermometer and heat canola oil to 275 degrees. Add 1/2 of the fries and cook for five minutes. Remove fries and place on a sheet tray and repeat with the remaining fries. Remove oil from heat and chill fries in the freezer for about 15 minutes until cold, but not frozen. Reheat oil to 350 degrees and again fry the fries in batches until golden and crispy. Remove fries from the oil and drain on paper towels. While fries are still hot, toss with Old Bay seasoning and kosher salt. Serve hot along with apple cider vinegar and ketchup for dipping. One of my favorite countries to visit is Greece. My husband and I have traveled all over the Peloponnese, the Cyclades Islands and Crete. But I still remember that it was in Athens, at a street corner stand, where I had my first authentic gyro. I remember that we had just walked about six miles, it was hot, we were exhausted and we sat under a shady tree in a city park devouring our gyros. And when we returned from vacation, we would crave Greek food and attend just about every Greek Festival in the San Francisco Bay Area. Our favorites were the San Jose festival held the first weekend of June, and the Belmont festival held over Labor Day weekend. San Jose has the best Dolmades (stuffed grape leaves), and Belmont has the best Loukamades (warm donuts in a honey-cinnamon syrup). Both of which I will be making and sharing my recipes in upcoming posts. Just because we're both vegan now, doesn't mean that we still can't have a gyro. And I could sell this gyro at any Greek festival and no one would have any idea that it didn't contain meat and dairy. My husband couldn't believe how authentic the flavor and textures were and said that he could eat this every weekend. I made my own Greek-Gyro flavored seitan from scratch, but you can purchase whatever brand of seitan you like. I also made my own Tzatziki made with vegan sour cream, dill, mint, garlic, diced cucumber, red wine vinegar, lemon juice, olive oil, salt and pepper. For the bread, I went to a Middle Eastern market and purchased authentic pita, toasted it slightly and brushed it with olive oil before piling on all the ingredients. 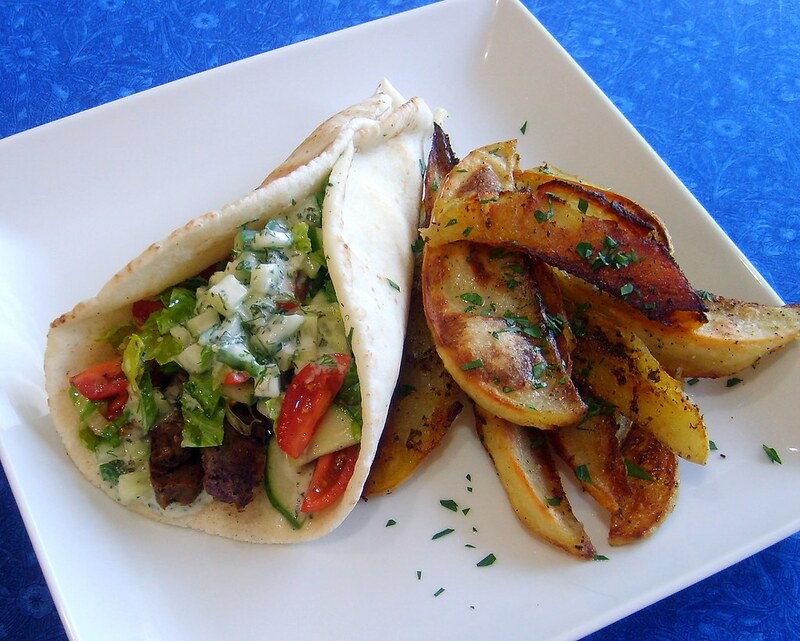 Most gyros in Greece are topped with Lemon-Oregano fries (Patates Lemonates). I decided to serve my fries along side the pita which made it a little easier to eat. 1 1/2-2 pounds medium sized Yukon gold or white potatoes, peeled and sliced into wedges. 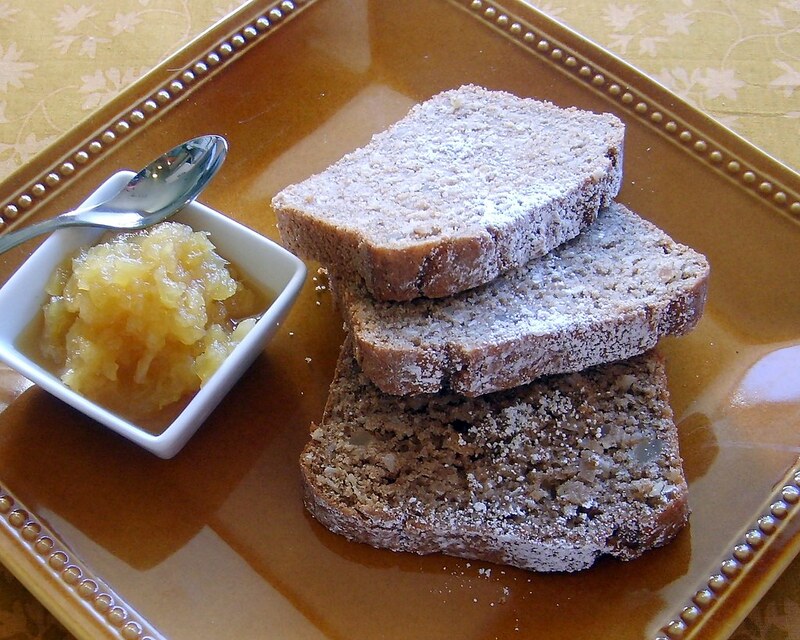 Make sure that you use boiling or waxy potatoes--not russets. Toss potatoes in olive oil, lemon juice, oregano, and salt and pepper and spread out evenly on a sheet pan with edges or a large casserole dish. Add enough filtered water to just cover the potatoes. Bake in the oven until all the liquid is evaporated. Drizzle with additional olive oil and bake until golden brown. Just before serving, squeeze with additional lemon juice and kosher salt if needed. I used to serve this dish when I worked at the restaurant except that it was made with heavy cream instead of cashew cream. Back then, I had no idea how simple it was to use nuts as a substitute for heavy cream, or I would of switched a long time ago. The health benefits of eating cashews are endless. They are high in protein and soluble fiber, contain heart friendly monounsaturated fats, B vitamins, and numerous minerals such as magnesium, potassium, copper, iron, and zinc. I don't think that you can say the same about consuming heavy cream! And the dish tastes better too! It's not as heavy and the fresh flavor of the basil really comes through. It's also feels good to eat something and not feel guilty afterwards! This dish takes a little planning because you need to soak the cashews overnight, but it's worth the wait. It also helps if you have a high powered blender such as a VitaMix, which I do not have. I have a cheap blender and so I had to let it run on high for about 4 minutes to really puree the nuts. Soak cashews overnight in the refrigerator, completely covered in about two cups of filtered water. Drain cashews and place in a blender and cover with water and blend on high for about 4 minutes until creamy. Add more water if necessary. Strain cashew cream through a fine mesh strainer, lined with cheesecloth into a bowl and set aside. You should have about two cups of cream, maybe more. Remove basil leaves from stems and blanch in boiling water for 30 seconds and then shock in an ice bath to stop cooking and retain bright color, drain and set aside. In a small saute pan, cook onions and garlic and a little salt and pepper in olive oil on medium-low heat until soft, about 5-7 minutes. Add about 1/4 cup of vegetable stock to prevent burning. You do not want to brown the onions or burn the garlic. Remove from heat and let cool for about 10 minutes. Return cashew cream back to the blender, add onion mixture, basil leaves and blend until smooth, adding additional vegetable stock to get the right consistency of cream. Add salt and pepper to taste. Strain basil cashew cream through a fine mesh strainer. You do not need cheesecloth for the second straining. 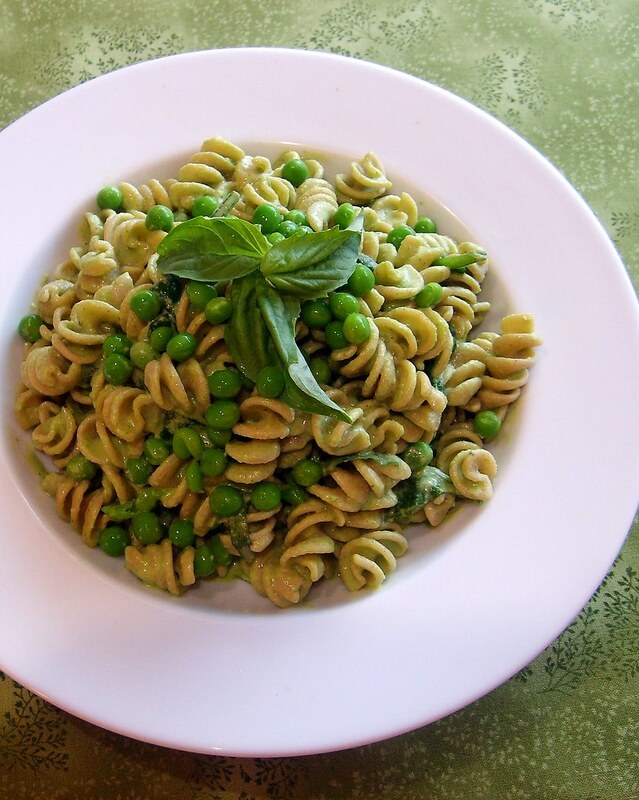 You should have about 3 cups of basil cashew cream when finished and it should be bright green. In a large saute pan, add cooked pasta, some vegetable stock, spinach and peas and toss together and cook until spinach wilts. Pour over basil cashew cream, toss and heat through and then remove from heat. Do not over cook the sauce because you want to retain the bright green color. Check seasonings again and add salt and pepper if needed. Garnish with toasted pine nuts, fresh basil leaves and a squeeze of lemon juice...Enjoy! I had left over chili from last night's dinner and so I decided to make tostadas. 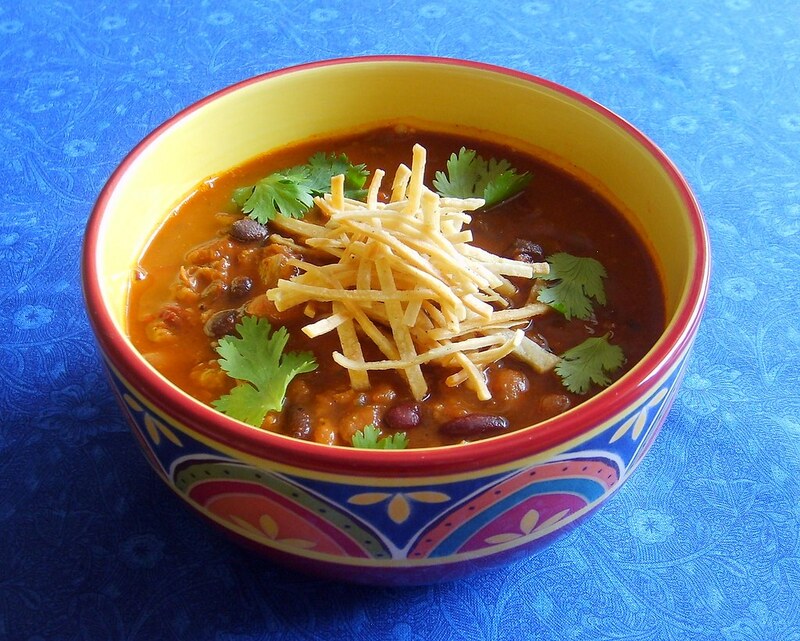 Normally I would make a black bean puree (recipe below), but I wanted to use up the chili. I just reduced the chili until it was really thick, like a puree. These tostadas would also make a great appetizer for a party. 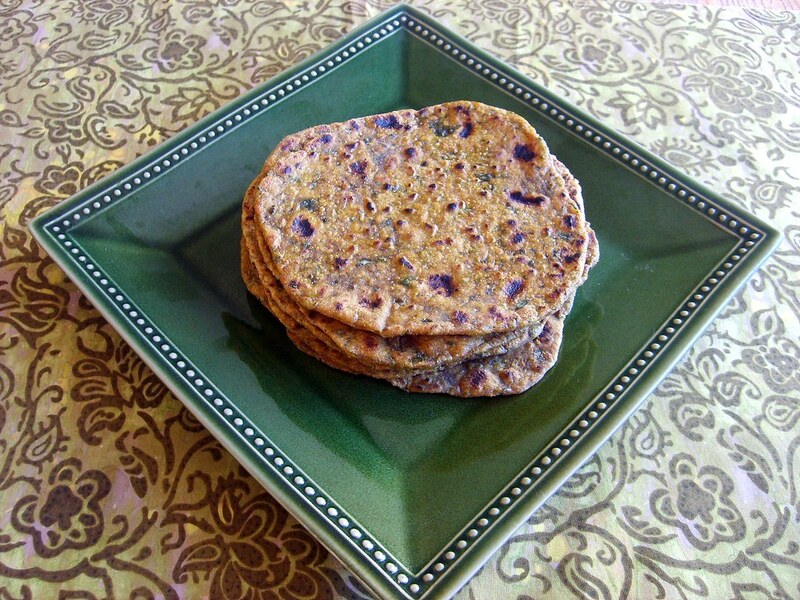 For this recipe, I used 4" corn tortillas that I purchased from a Hispanic market. If you can't find the smaller tortillas, just use the regular size. However, if I were serving these as appetizers, I would cut each tortilla with a 2-3" round cookie cutter for an individualized two-bite serving. Spray a sheet pan with cooking spray and place tortillas on tray. Spray the tortillas lightly and sprinkle with kosher salt. Bake for 10-12 minutes until crispy and lightly golden brown. Turn tortillas every 2 minutes for even browning and be careful during the last few minutes of cooking so they don't burn. Note: You can also use pinto beans but I like the contrast using the black beans. Heat canola oil in a saute pan on medium and cook onions until soft. Add garlic and spices and cook for a couple of minutes longer. Add a little vegetable stock to prevent burning. Place all ingredients, except vegetable stock in a food processor or blender and pulse until smooth, adding a little bit of vegetable stock to get the right consistency. Mix together all ingredients in a bowl and chill for about 30 minutes for flavors to combine. In addition to the pineapple-avocado salsa, I finely shredded green cabbage and tossed it with a little lime juice, salt and pepper. 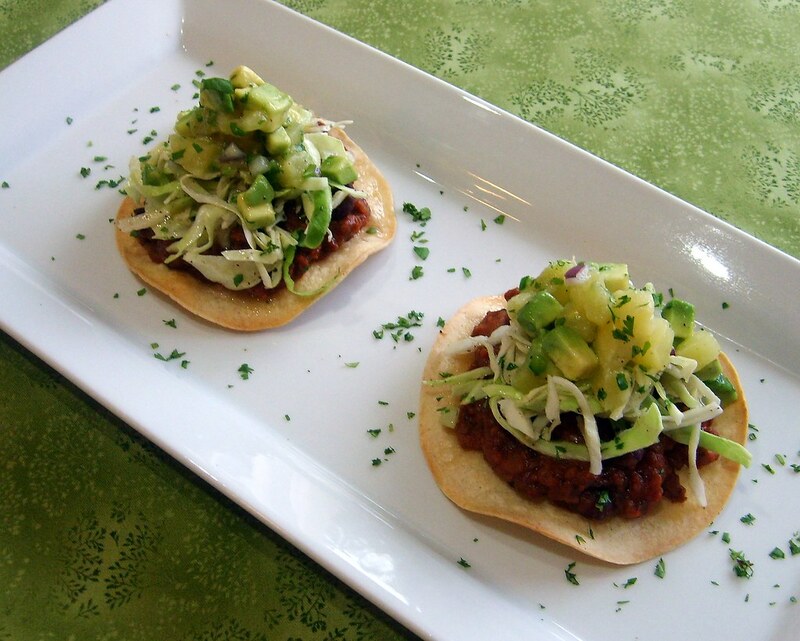 Layer the tostada with bean puree, shredded cabbage and salsa and sprinkle with a little minced cilantro. Enjoy! Anyway, since I associate eating chili with winter months and football playoffs, I thought it would be perfect for tonight's dinner since we'll be watching the Stanly Cup Conference Finals. Unfortunately, the Sharks won't be playing until tomorrow, but tonight we'll watch the Bruins-Lightening game, and enjoy it with a big bowl of Spicy Three Bean Chili. GO SHARKS!!! Note: If you don't want to use the Yves, just substitute another can of pinto beans. In a large stock pot, add canola oil, and onions and cook on medium-low for about 5 minutes until soft. Add garlic and cook for two minutes longer. Add the next 8 ingredients and stir to combine. Increase heat to medium-high and cook for about five minutes until beer reduces by half. Next add tomato puree, diced tomatoes and two cups of water. Bring to a boil and reduce to medium-low and simmer for about 45-60 minutes until flavors combine and sauce thickens. Add salt and pepper to taste during cooking process. During the last 15 minutes of cooking, add the beans and the Yves Meatless Ground and heat through. If too thick add additional water to desired consistency. Garnish with tortilla strips, cilantro and lime wedges. Cut tortillas in half and then into fine strips. Spray baking sheet with canola spray and lay strips evenly on tray, trying not to overlap. Spray strips lightly with canola spray and sprinkle with kosher salt. Bake for 10-12 minutes, tossing and turning every two-three minutes. Be careful during the last five minutes of cooking to make sure that they don't burn. I remember when I was a young girl growing up in Maryland we couldn't wait until the first ears of Silver Queen corn would appear at the road-side stands. The kernels were so sweet and tender that you didn't even need to cook them. So when I was at the market today, I knew exactly what I was going to make for dinner tonight when I saw the large stalls of local sweet white corn. I love chowders and they are so easy to make. 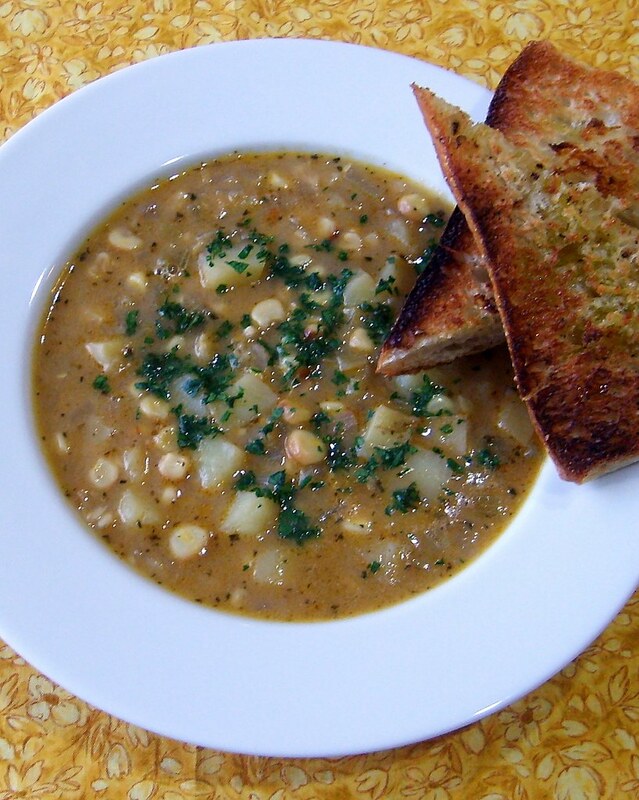 Besides making this Roasted Corn & Potato Chowder, I also like to make Curried Cauliflower & Potato, as well as Slow Roasted Tomato and Potato Chowder. But since corn is in season, roasted corn chowder it is! Preheat broiler to 475. Shuck corn, remove silk and roast on a sheet pan until lightly charred and golden on all sides. Let corn cool and remove kernels with a knife. Set aside. Dice all vegetables and mince garlic and thyme. In a stock pot or large sauce pan, add canola oil and saute onions and celery for about 5 minutes on medium-low heat until soft. Add garlic, thyme and Old Bay Seasoning and stir to combine. Add butter and stir until melted and then add the flour and stir to combine. Next add vegetable stock and rice or non-dairy milk and bring up to a boil, reduce heat to medium and add diced potatoes, roasted corn, worcestershire sauce and Tabasco. Cook on medium until potatoes are soft and flavors are combined, about 20-30 minutes. During the last five minutes of cooking, add pale dry sherry and add salt and pepper if necessary. Garnish with parsley and a squeeze of fresh lemon juice and serve with warm crusty bread rubbed with garlic and drizzled with olive oil. I try not to use coconut milk in my cooking on a regular basis because it is high in saturated fat, even though the saturated fat comes from a plant source. However, I read that some studies have shown that people in countries who consume large amounts of coconut milk, or cook with coconut oil usually have a lower rate of heart disease. They attribute this to their overall diet and the use of fresh fruits, vegetables and tofu/tempeh when preparing dishes that use coconut derived products. So for my Malaysian Coconut Curry Soup, I decided to use a combination of lite coconut milk, full-fat coconut milk and vegetable broth. If you are really concerned about the amount of saturated fat in your diet, then use lite coconut milk only. Or, another option would be to purchase 8-10 ounces of coconut water and blend it with a 1/4 cup of organic silken tofu to obtain the creamy texture. 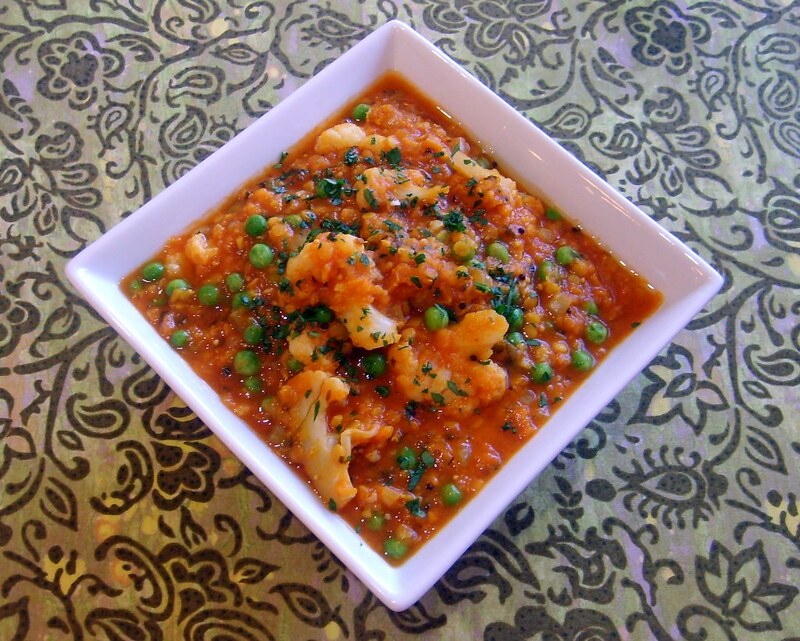 I have used this technique before and have received good results when making curries and stews. Note: I used Japanese Udon noodles because that is what I had in my pantry. 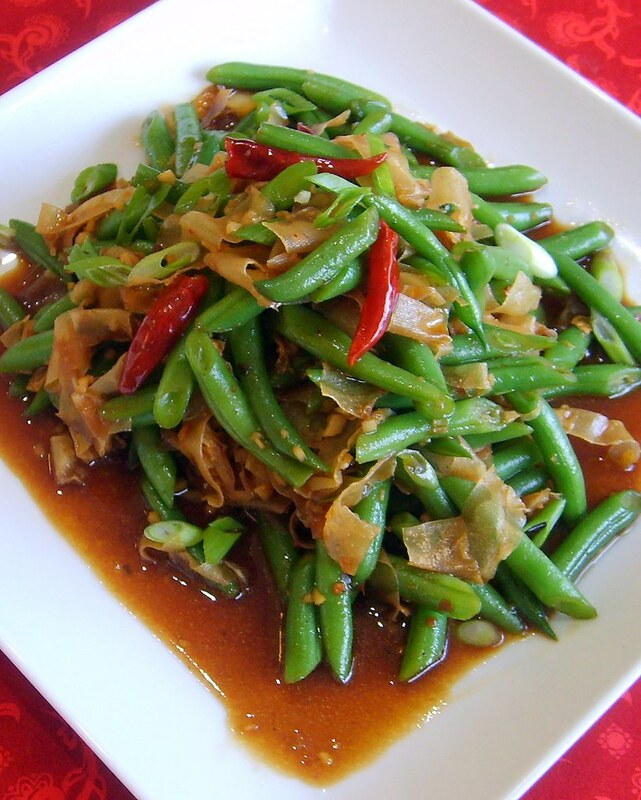 You can you rice noodles, ramen noodles or even jasmine or basmati brown rice. Spray a large sauce pan with canola cooking spray and add shallots, garlic, ginger, lemongrass and chilies. Cook on medium-low for a couple of minutes until fragrant, being careful not to burn. 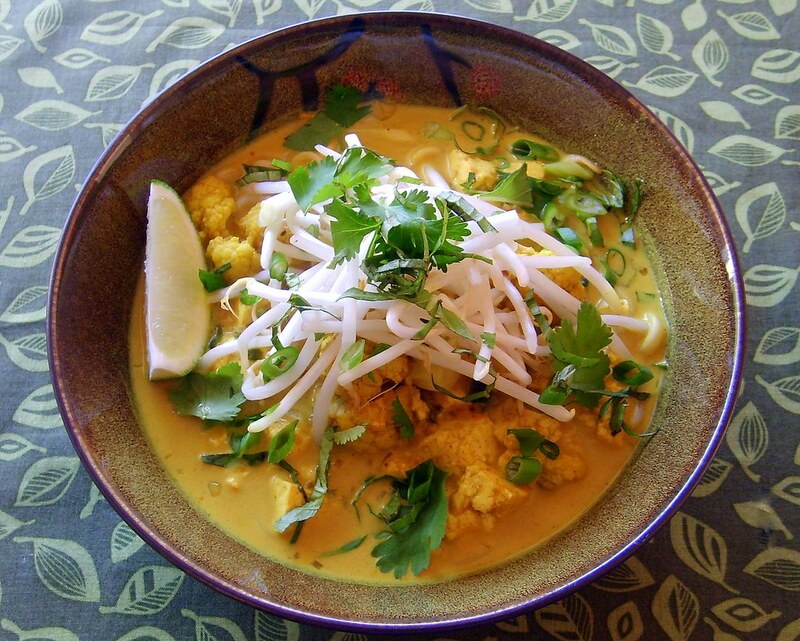 Add curry, turmeric, vegetable broth, scallions, agave syrup or brown sugar and the lime juice. Bring to a boil and reduce heat to low and simmer for about 15-20 minutes for flavors to combine. While broth is simmering, steam cauliflower until crisp-tender and set aside. Also drain and dice tofu and set aside. Cook noodles according to package, drain and keep warm until ready to use. Add coconut milk to broth and bring to a medium simmer. Just before serving, add cauliflower and tofu and heat through. Portion 1/2 cup noodles in each bowl and ladle curry soup over top. Garnish with desired condiments and serve with a lime wedge. 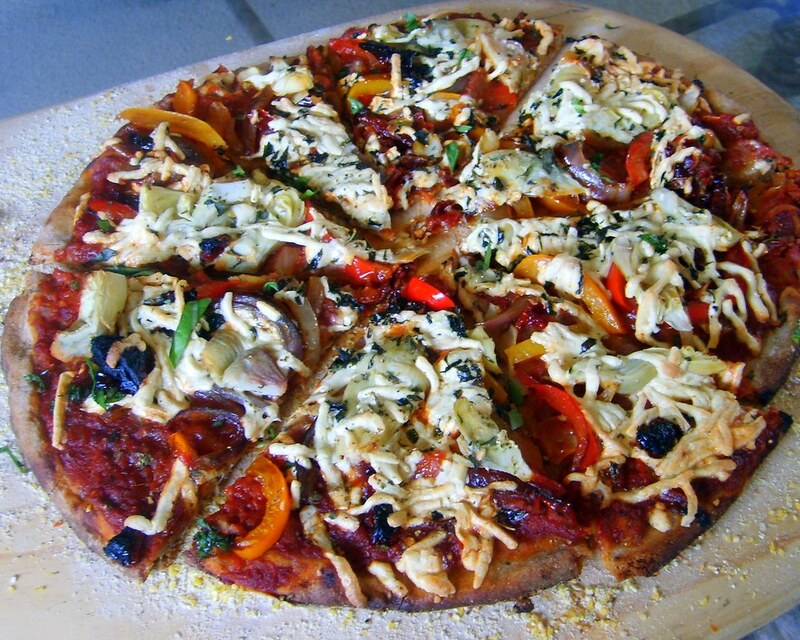 I love eating pizza and who doesn't, especially a pizza that is healthy and delicious! Pizza is very easy to make at home. You can either purchase a pre-made pizza sauce or follow my recipe below. For the crust, I used Trader Joe's whole wheat pizza dough. The instructions on the package says to let the dough sit for 20 minutes before rolling, but this is not enough time for the gluten to relax and it is difficult to roll out. And if you like a thin crust, like I do, then you need to let the dough rest for about an hour before rolling. The dough makes enough for two medium size pizzas and one pizza serves two people. In a 3qt sauce pan, add olive oil, a little salt and pepper and saute onions and garlic on low until soft, about 5-7 minutes. Add tomato puree, water and remaining spices. Bring to a boil, reduce heat to a simmer, stirring frequently and cook for about an hour until most liquid is absorbed and the sauce is thick. Remove bay leaf, taste again for seasonings and add more salt if needed. Note: These are my favorite vegges to use on pizza, but you can add mushrooms, broccoli rabe, asparagus, etc. Also, I saute my onions and peppers until slightly soft before adding them to the pizza. Preheat oven to 475-500 degrees and place pizza stone on the bottom rack in the oven. Preheat the pizza stone for at least an hour before using. On a floured surface, roll out pizza dough to desired thinness. Sprinkle cornmeal or bread crumbs on pizza peel so that the dough doesn't stick when you're transferring the pizza to the pizza stone in the oven. Place dough on pizza peel and lightly brush dough with olive oil and add a good amount of pizza sauce and spread evenly on the dough. Layer pizza with sauteed onions and peppers, artichokes, capers, olives and sprinkle with cheese. Transfer pizza to pizza stone and bake for 10-12 minutes until crust is crispy and cheese is bubbling. Remove from oven and sprinkle with a little sea salt and shredded basil leaves. You can also drizzle with a little more olive oil if you prefer. Cut into slices and enjoy!! !